An interview series featuring Ginza people in conversation with violinist Chisako Takashima. 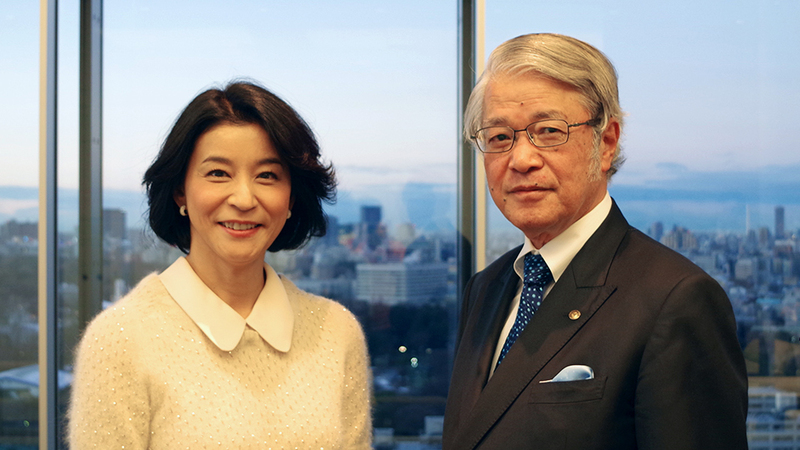 With a special fondness for Ginza, which holds many memories both from her professional and private lives, Takashima explores Ginza from various dimensions with her guests.In this volume she welcomes Chairman and CEO of Tokyu Fudosan Holdings Corporation, Mr. Kiyoshi Kanazashi. My personal relationship with the Tokyu group goes back to when I was a small child. I used the Tokyu line to go to school. My familiarity with the Tokyu group makes me all the more excited that Tokyu Fudosan Holdings Corporation will open Tokyu Plaza Ginza on March 31. I must say, that was quite a challenging project. A great deal of time and money went into it (laughs). Yet you sought to open a new establishment in that location. It is indeed an excellent spot in Ginza 5-chome. Yes, it is a one-of-a-kind location, facing the Sukiyabashi intersection. Given that Ginza is an international commercial center, we hope to run the building as the Tokyu group’s flagship establishment. Since our group has been long known for its presence in the western areas of Tokyo, we hope that Tokyu Plaza Ginza will serve as the Tokyu group’s eastern hub. We have high expectation for future developments. It will be a commercial establishment with 13 floors, including 11 stories above ground and 2 basement floors. The façade has been designed in the image of a “dish of light” made of Edo Kiriko cut glass. We will have 125 shops carrying a wide variety of high-quality and trendy products. We will also have an airport-style duty free shop covering a floor area of 4,000m2 so that customers from abroad can also enjoy shopping. Wow! You will surely enjoy a lot of attention! I am hoping that our public space will be an attractive place for our customers. Named the Kiriko Lounge, it is spacious, with a high ceiling of several stories. In collaboration with Bunkamura, from the Tokyu Group, we plan to hold concerts and other cultural events,. Parties and music events can also be held on the Kiriko Terrace on the roof. We seek to produce an establishment where different people and inspirations from various cultures and generations meet. May I ask you to please tell me how Tokyu Fudosan Holdings was established? The starting point for Tokyu Fudosan Holdings was a pioneering project in 1923 to develop Den-en Chofu as a historical town. Since that beginning, we have engaged in real estate development through Tokyu Land Corporation, which was founded in 1953, and have advanced into property management and the real estate brokerage business. Tokyu Community Corporation and Tokyu Livable, Inc., both of which came into existence at the beginning of the 1970s, went on to establish leading positions in their respective industries. Tokyu Hands, another group affiliate, was established later, exhibiting our corporate consciousness to evolve ahead of the times. When was Tokyu Fudosan Holdings established? It was founded in October 2013. Today, we are engaged in a diversity of businesses in approximately 100 group affiliates employing 18,000 people. Do you have a common slogan that brings your group affiliates together? It is “sharing tomorrow’s inspirations”. It is a verbalization of the group’s ideals, which have been revealed through questionnaire surveys conducted across all employees.